The "For the People Act" (H.R. 1) is a bold, comprehensive set of solutions that did not originate in Congress. These ideas came from the people and have been won in cities and states from coast-to-coast, making the act, "by the people," too. Out in the “laboratory of the states” where the government is closest to the people, Republicans, Democrats, smaller parties and independents have been working together and winning. They’ve won on Automatic Voter Registration making every eligible person registered to vote without any extra effort. It strengthens election security, increases participation, and saves states money. They’ve won small-dollar-donor matching programs that reduce money’s influence, impartial citizen redistricting commissions that draw fair maps and put an end to gerrymandering, forever. They’ve won ethics reforms and impartial commissions and so much more. People from across the partisan divide have done this because they know democracy is not a partisan issue. Finally, all these ideas, tested across the country, are coming together in the first piece of legislation before the 116th Congress, the “For the People Act” (H.R. 1) to strengthen the people’s voice in self-governance. There is still one shrinking group of people in one small part of Washington, D.C. who still believes democracy is partisan, that not all eligible people should vote, and, frankly, who find the phrase “small-dollar donor” a joke. Big donors, big money, and wealthy special interests drive these few and they are skilled in the politics of polarization and obstruction. Sen. Mitch McConnell is the poster boy for the old guard, still blissfully unaware just how significantly the mood of the country has changed on these issues. Last week the House Judiciary Committee started its first hearing of the 116th Congress by debating the “For the People Act.” It was clear the GOP members of the committee didn’t have a real response to the pragmatic proposals to restore people’s faith in our democracy by engaging them more directly in various parts of the process. The landmark legislation provides for three monumental sections of reform: voting rights, improving accountability in campaign finance as well as creating a system of public financing, and government ethics. Though it’s a long way from becoming law, the bill reflects the emergence of a national movement of ordinary Americans from all walks of life. Working together these people are winning similar reforms at the local and state level to reduce barriers to full participation in our democracy too many of our neighbors face. Grassroots activists and people who’d never paid much attention to politics started organizing in earnest in 2010 after the Supreme Court’s decision in Citizens United v. FEC, looking for practical solutions to curtail the excess of unaccountable, secret money influencing our elections and government. And more people joined as the decade went on, motivated by SCOTUS decisions curtailing enforcement of common sense rules to bring balance into our politics, voting rights and ethics, into proper balance. Still, more Americans grew angry at politicians stealing the power of the people only to strengthen their narrow score through the unfair GOP project known as Red Map 2010. This strategic GOP plan used gerrymandering in 2011 to secure a disproportionate number legislative seats in states and in Congress. With 227 co-sponsors (as of 2/1/19), almost all the House Democrats support the For the People Act. As of that same date, there has been no movement toward common sense from Sen. Mitch McConnell who blocks Republicans from supporting any and all reform efforts to strengthen our democracy. Opponents of the bill expressed several issues at the hearing. In the words of minority witness J. Christian Adams, decentralization promotes freedom, and that The For the People Act implements federalization of voting procedures. The minority witness was Hans von Spakovsky, who argued that the bill makes it ‘too easy to vote,’ thus suffocating the power of local election officials. Senate Majority Leader Mitch McConnell (R-KY) argues that it is a “power grab,” as some of the voting reforms in the bill would likely assist Democratic candidates more than their Republican counterparts. Some say that the re-enfranchisement of convicts after they serve their terms violates Section 2 of the 14th Amendment to the Constitution, which states that committing a crime disallows someone from voting. But it is exactly that amendment’s language that lawyers argue the Voting Rights Act of 1965 worked so hard to impugn. 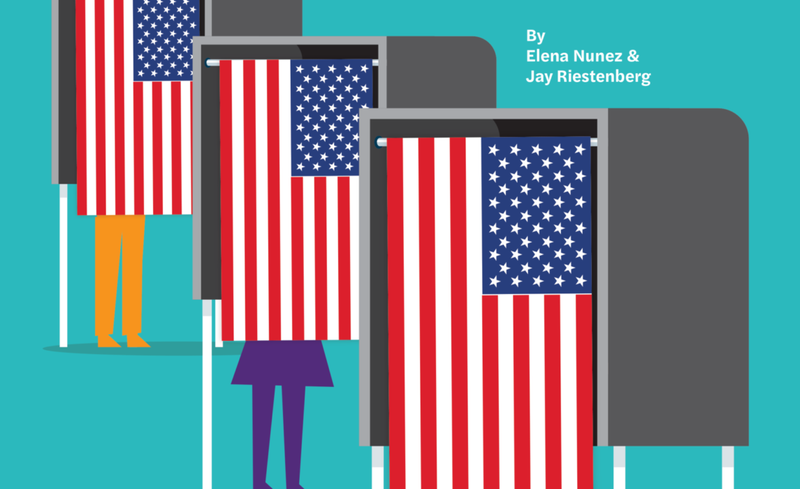 Given the racial discrimination present in our criminal justice system today – and the history of the 14th Amendment – legal experts predominantly agree that re-enfranchisement presents a just way to combat voting prejudices. The For the People Act is an important foundation on which we can continue to build. Without voting rights, higher ethical standards, and an equitable political system, there are no next steps; before debates on climate change, immigration policy, or tax reform (to name a few) can continue, the very basis of governance must be assured to the people. It’s time to pass this bill – and soon – so that Congresswoman Bass can again have pride in the electoral system, and the injustices recently seen in North Carolina, Ohio, Texas and across the nation won’t come to pass ever again. It’s time for the people to have their rights returned. Senator McConnell may describe it as grabbing power, but I believe it’s actually rightfully restoring it. H.R. 1 will continue its tour by visiting the House Committee on Oversight and Reform on Wednesday, February 6, at 10:00 AM, 2154 Rayburn House Office Building. Common Cause president, Karen Hobert Flynn, will be testifying. For a more comprehensive argument on all of the benefits of H.R. 1, please consider reading here.